A local in rural Dhading transporting corrugated sheets to his village for reconstruction of his quake-ravaged house. 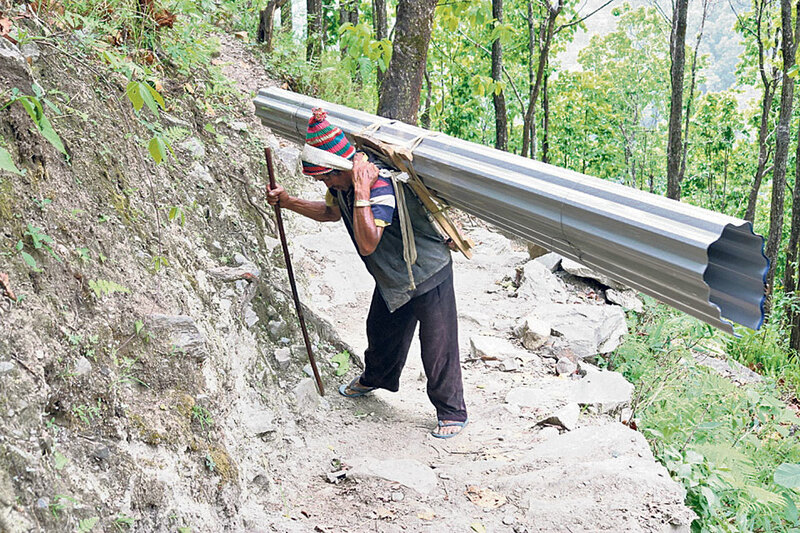 DHADING, May 22: Pemba Tamang was recently seen heading uphill carrying a heavy load of corrugated sheets on his back. Pemba, a local of Khaniyabas Rural Municipality in Dhading district, has been transporting construction materials to his home since the past few days. “It has been weeks since I started carrying sacks of cements and other construction materials for reconstruction of my house,” he said, adding, “Everyday, I have to walk uphill for up to seven hours,” added Pemba, who was accompanied by his wife and a son. They have been living under tarpaulins since the catastrophic earthquake of April 2015 demolished their home. For the family, the situation has not changed even three years after the quake. They are finally initiating the rebuilding process using the first tranche of the housing reconstruction grant provided by the government. There is an off-road of 40 kilometers from Dhadingbesi to Dhundure. Settlements beyond Dhundure, including Jharlang, Tipling, Sertung, Lapa and other areas have to rely on foot as the only means of transportation. Left with no choice, locals from those rural areas in the northern parts of the district are transporting the reconstruction materials on their backs. Most of the quake victims in those areas have not completed reconstruction of their quake-ravaged houses. Majority of them are only starting the reconstruction. While many of them have already claimed the first tranche of the grant, they have not met the criteria to claim the second and the third tranches. Difficult topography, inflation of construction materials and poor financial condition among other factors have contributed to the lack of progress in the reconstruction works even after three years of the Gorkha quake. “Forget about motorable roads, there are no proper paths even for movement of people in many places. The paths along the cliffs are narrow and there is high risk of slipping down to death during rainfalls,” said Pemba. “In such condition, I mostly used stones and mud available locally while few other necessary materials have to be purchased from the nearest marketplace. Another local, Narsingh Tamang also cited the same reasons for being unable to construct his quake-damaged house. “Of late, however, we are taking the chance despite the difficulty of walking uphill and downhill for hours, carrying heavy loads of construction materials on our backs,” he added. Road network has not yet reached Sertung and Lapa of Ruby Valley. In lack of road connectivity, many goods of daily necessities are transported on the backs of mules from the district headquarters, which can take up to two days. Among many factors, locals say lack of road connectivity is the major hurdle which has slowed the progress of reconstruction. In the district, a total of 69,974 households have been included in the list of beneficiaries for the housing grant. Of them, 69,321 victims have claimed the first tranche of the reconstruction grant. Likewise, 35,617 victims have received the second tranche while 9,033 have claimed the final tranche, according to the National Reconstruction Authority (NRA). Another major hurdle for the quake victims is the lack of access to banks at the local levels. There is not a single banking service in northern parts of Dhading, including Ruby Valley, Khaniyabas, Netrawati and Ganga Jamuna rural municipalities. Victims of the rural areas are forced to travel to the district headquarters to claim the housing grant. Although the district headquarters has two government banks and over a dozen private banks, those banks have not been able to expand their services to rural areas of the district, resulting in great inconvenience to the locals residing in those areas. “Just to claim the housing grant, we have to spend tens of thousands of rupees, resulting in little value of the quake grant,” said Narsingh. “For many of us, those extra expenses just to receive the quake grants have resulted in heavy debts,” he added. Elsewhere in Khotang district, many victims are yet to get the second tranche of the quake grant, resulting in a halt in the reconstruction works. According to Bhim Kumar Budhathoki, a local of Rupakot Majhuwagadhi Municipality-7 of the district, the NRA is delaying in providing the second tranche, resulting in dismal progress of the construction works. “The farming season about to start but construction of our house has not yet been completed. If we wait further for the grant, I do not think we’ll be able to protect ourselves from incessant monsoon rain,” he said. According to Chanchal Pokharel, ward secretary of Halesi Tuwachung Municipality-9, technical delays have prevented even those meeting the requirements from claiming the second tranche of the grant. Khotang has 8,443 beneficiary families, out of which 8,062 of them have received the first tranche of the grant. As many as 381 households are yet to claim the first tranche of the grant.